1. Choose a piece of blank pottery. There is a good variety of pottery to choose from, functional, ornamental and decorative items. A good range of colours in the specialist paints which are water based and non toxic. Sit down and start, you may wish to draw your design on the pottery in felt tip pen. (Pen marks will disappear in the firing process). There are stencils, stampers,stickers and photograph albums in the studio to aid inspiration, you may trace designs from the folders in the studio or bring a picture along that you may like to trace on then paint. Staff will be able to advise you and offer suggestions and painting tips too. 4. Leave your pottery to be glazed and fired. We will glaze and fire your finished pottery and it is ready for collection in a few days, or we can post it on to you for an additional fee. 6 . How long does it take? Spend as long as you like painting. 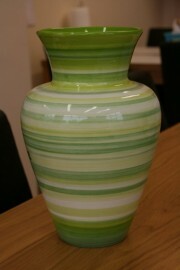 When you finish painting your item, you leave it with us to be glazed and fired. This takes a few days. You’ll be advised as to when your pottery will be ready to collect, and we will contact you if it’s ready before the date given. 7. When do I pay? Payment is due on the day (not when you come to collect it after its been fired) .Payment methods :-Cash or pay via chip and pin only. 8. What about dishwasher and microwave? Your pottery is earthenware and has a dinnerware safe glaze. We recommend that you hand wash it and do not put it in the microwave. Please Note: Imperfections in ceramic products can occur. If the imperfection is due to product or kiln firing the customer may remake at no charge and will be notified by management about this .Customers do need to follow guidelines regarding application of paints.